Rep. Todd Stephens meets with second graders of the Simmons Elementary School to promote the Department of Agriculture’s Dog License Awareness Poster Contest. HARRISBURG—In a move to encourage pet owners to license their dogs, Rep. Todd Stephens’ (R-Montgomery) district office is now one of eight dog licensing agents in Montgomery County. 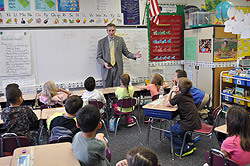 Stephens also visited with all six second-grade classes of Simmons Elementary School in Horsham where he discussed the Department of Agriculture’s Dog License Awareness Poster Contest. The poster contest is part of the Department of Agriculture’s effort to educate pet owners that they must make sure their pets are properly licensed. For more information about the poster contest, go to http://www.licenseyourdogpa.com/files/PosterContest.aspx. The regular license fee for a male or female dog is $8.45, or $6.45 if it is neutered or spayed. For a senior citizen the fee is $6.45 for a male or female, and $4.45 if it is spayed or neutered. With proof of disability, individuals can also receive the reduced rate for their licenses. “I am hopeful this will make it easier for dog owners to have their pets properly licensed,” Stephens said. The Humane Society of the United States commended Stephens’ efforts. “A few dollars buys you and your dog piece of mind. If you and your furry family member are ever separated, a license is the surest way to reconnect with her. Plus, you’ll be helping other dogs. Funds from dog licenses help fight puppy mills – where dogs spend their lives in misery just to produce puppies for profit. We appreciate Rep. Stephens’ efforts to help pet owners protect their dogs while helping countless other dogs across Pennsylvania,” explained Sarah Speed, Pennsylvania State Director of the Humane Society of the United States. Stephens’ office only accepts checks made payable to the Montgomery County Treasurer. Stephens’ office is located at 515 Stump Road in North Wales. You can call 215-368-5165 for more information.